Arrive at Yangon International air-port; meet the native English speaking guide. Transfer to check in hotel. Lunch break. Start sightseeing of Yangon city center, Sule Pagoda, City Hall, High court, Independence monument where you can see the bustling life of the city. 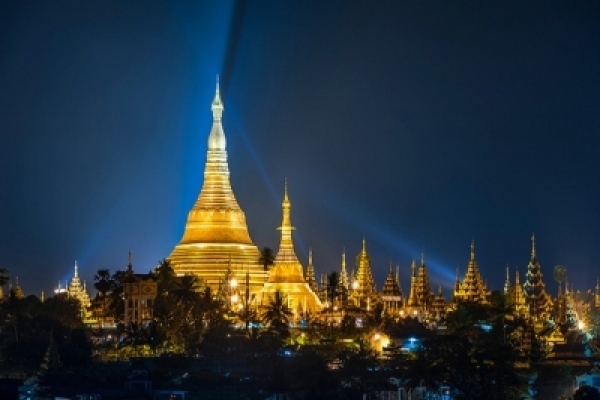 Then proceed to the well-known Bogyoke (Scott) market-famous market of Yangon and visit the most spectacular religious edifice,Shwedagon Pagoda for daybreak sunset. Overnight in Yangon.Remarks: Bogyoke (Scott) market, National Museum are closed on every Monday and Government holidays. After morning breakfast, transfer to airport for Bagan flight. Check in hotel.Start visiting NyaungOo market – which is full of local products, Proceed to Gold gilded Shwe Zi Gon Pagoda – built by the founder of Myanmar Bagan dynasty king Anawrahtain 11th century,Ananda Temple-An accredited Mon ethnic brick architecture and most beautiful temple in Bagan. Manuha Temple-constructed by a Mon King,That Bin Nyu Temple -an attractive architecture brick mason in South- East Asia,Gaw Daw Palin Temple – The finest brick structure built in Bagan, visit the lacquer ware industry and their process works. Dinner will be provided at Nanda restaurant with Puppet show.Overnight in Bagan. 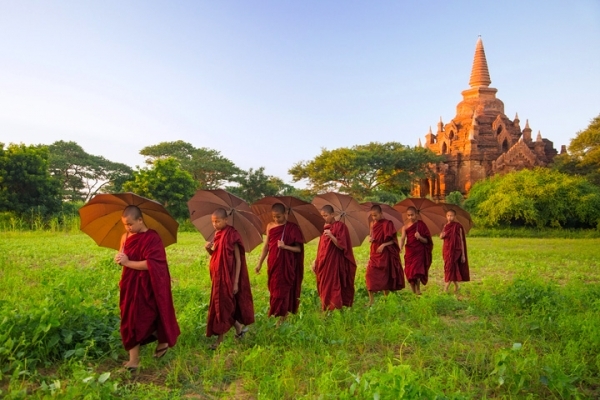 Take a day return trip by coach to Salay town which was established during Bagan period. 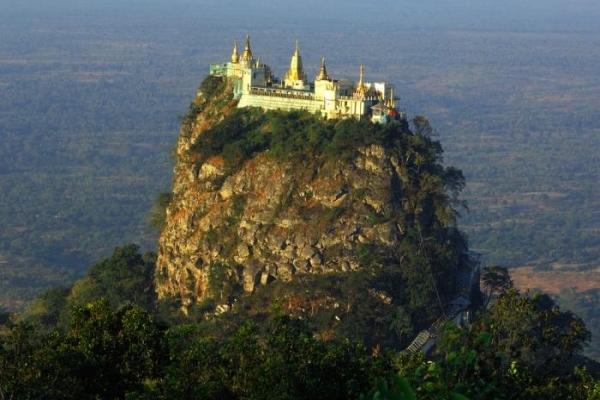 Visit the famous Yoke Sone monastery, local market- where you can explore the native product and continue to Mount Popa- an extinct volcano shrines dedicated to home of the spirits known as living being spirits. For your energetic climb the 777 steps to the shrine top of the dead volcanic. Transfer to airport for Mandalay flight. Overnight in Mandalay. After morning breakfast, start Amarapura highlights of Maha Gan Da Yone monastery -where you can see nearly hundreds of monks while they are having their 2nd or last meal of the day and observing the Buddha scripture teaching. Proceed to 1.2 Km long U Bein teak bridge – which was recuperated from the waste of abandoned Ava palace, Wood carving, Marble carving and Bronze casting. Lunch break.Return to visit Mandalay Maha Myat Muni Buddha Image -A spectacular Buddha image of Rakine feather, Gold-leaf processing method, Shwe Nan Daw Kyaung (Golden Palace Monastery)- a traditional teak architect handicraft design, Kuthodaw Pagoda- known as the world’ s biggest books(Buddhist scripture), consisting 729 marble slabs, Tapestries andSilk weaving of Mandalay. Sunset would be spent at Mandalay hill for day-break. Overnight in Mandalay. 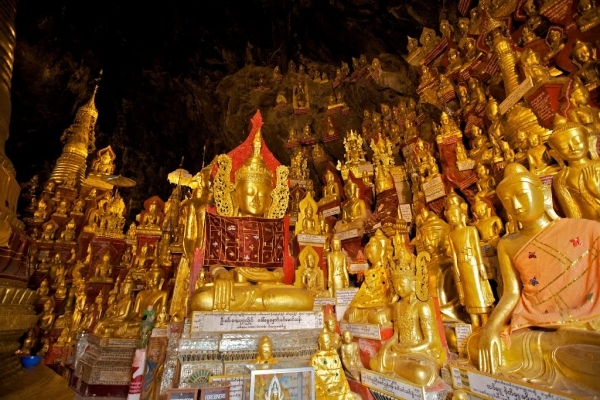 After morning breakfast, transfer to airport for Heho flight, on arrival continue by coach to Pindaya natural cave – where nearly 8000 of Buddha images are stored and visit the Shan Paper processing workshop, Bamboo Umbrella manufacturing process for daybreak.Overnight in Pindaya. After morning breakfast, proceed for an excursion sightseeing by coach to the gateway of Inlay Lake, which locates 900 meters(above sea level) for the home of unique one leg rower. 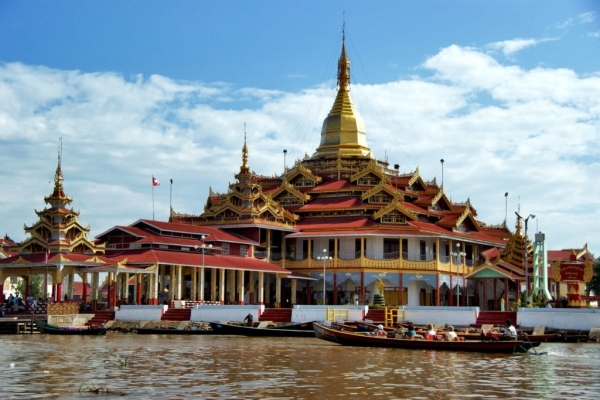 Explore the beautiful landscape floating market and floating gardens, conical fishing method, Famous Phaung Daw Oo Pagoda, Nga Phe Kyaung (Jumping cat) monastery – a beautiful collection of antique Buddha statues stored in an ancient teak monastery, silver smith designs of Inlay by boat.Overnight in Inlay. After breakfast, enjoy a boat ride to Indein which situates at the western of the Lake, to explore and watch the farmers cultivating their products. Visit the 16th century pagoda complex of Indein. Lunch break. Transfer to airport for Yangon flight. Leisure daybreak.Overnight in Yangon. After breakfast at hotel, leisure time to pursue individual interest until your transfer to the airport for departure from Yangon.